Ok not quite but almost. 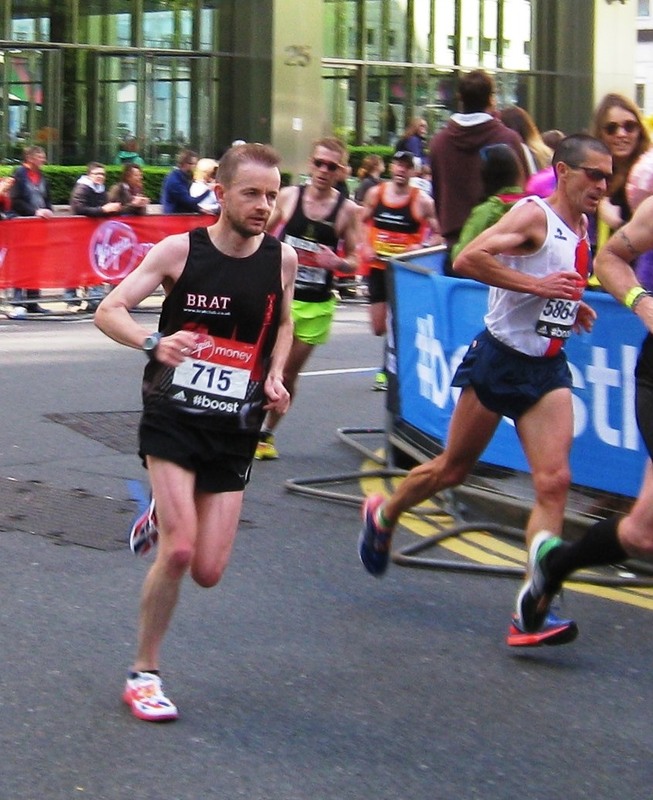 I went into this year’s London marathon with easily the least preparation for many a year. Only one training run of 20 miles all the way back in January and at a decidedly slow pace. Throw in a troublesome ITB and an unplanned trip to SA on a family emergency, and there wasn’t much marathon specific training going on at all. My planned diet of 60 and 70 mile weeks had been replaced with weeks varying from 3 miles to 50 miles. What I did have in my favour was that I knew my fitness level was decent and that I had 4 or 5 years of decent, consistent mileage behind me. A good batch of good solid training. And fresh legs. Saturday dawned and we headed off to London on a late morning train. We arrived and met our running chaperone, all-round-good-guy-and-in-no-way-sponsored-by-Adidas Dan, and travelled straight to the expo. I savoured the privilege of being able to register at the championship table, a first for me. I picked up my race pack and after the usual stampede through the expo, coupled with the usual indecision about which branded race gear to purchase, we headed for some lunch. The rest of the day was spent checking into the hotel, eating, watching Arsenal squeak into the FA Cup final, and more eating. I slept well enough. Shoes on, timing chips laced into both (a requirement for championship and elite runners only – another cheap thrill for me) , and off we went. Journey went smoothly and on arrival in Blackheath I hooked up with fellow BRATs Dan, Tim and Eloise in the separate championship start area. A quick warm-up to reassure ourselves that we did actually remember how to run, tying, retying (and then reretying) of the laces, a few obligatory photos, and once Timmy had finished styling his hair, we headed to the start line. 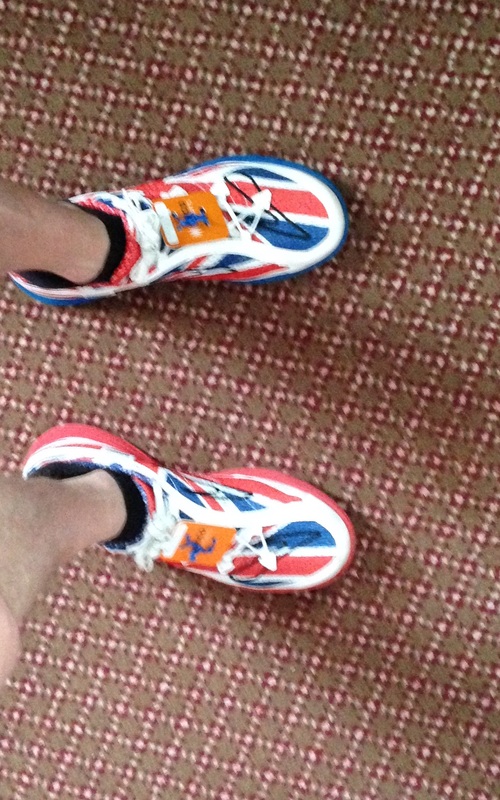 I was racing in my Union Jack emblazoned Brooks Green Silence. A relatively easy decision as I’ve had many good races in them in the past. But with that model now sadly discontinued (come on Brooks, change your mind! ), and my remaining pairs looking somewhat worse for wear, I don’t know how many more races they would see. As my running buddy Riaan put it to me post-race: “Nice way to finish the green silence marathon era”. I hadn’t considered that, but yes it probably was. We started directly behind the elite runners (an experience which for me was akin to standing next to the red carpet on Oscar night). It was a special thrill seeing the backs, and sometimes faces, of the best marathoners on the planet. Being so close to them felt a bit surreal. The crowd went wild for Mo naturally but there was good cheering for each of the other runners when their names and achievements were announced over the PA. But we’re not here to talk about that. Go time. The gun went and we were off. I had been in two minds for some time leading up the race about whether to start slow and ease into it, given the lack of miles in my legs or to throw caution to the wind and head off with Dan and Tim who were targeting 3:37 kays in search of a 2:33 finish. I knew I didn’t have that kind of time in me but had been toying with running with them for a portion of the race and then sliding off the back of the bus as and when it happened. I latched on behind them and set off. Without really knowing it I had opted for the “going for it” option. Before we got to the first mile marker the alarm bells were going. The pace didn’t feel like work but it also didn’t feel easy. We hit the first mile in 6 flat and I decided to pull the plug on it then and there. I knew it was a touch too fast and I knew if I stuck with it for a few more miles it would be too late to undo the damage. I backed off and ran without thinking about pace for a few minutes. Just assessing what I wanted to do. I still didn’t really know how I was going to approach it. I noticed someone who looked like they knew what they were doing. He had a relaxed stride and just looked easy. I thought, run with this guy for 5 miles, let him do the thinking, and see what happens. His vest said “Sean” on the back. I set off behind Sean and mentally cleared my head of any pacing thoughts for the time being. I clipped along behind Sean, we were running a nice even pace. I had chosen to set my watch to kilometres for the race. Two reasons, one it had worked well in Abingdon (my most recent marathon, a 2:47 in October 2013) and two, I figured the London course had mile markers with big clocks at every mile anyway so I could get my mile splits from that if I really wanted to. My watch was ticking off kilometres in the 3:45-3:55 range nicely now. Sean knew his game, clearly. A big shout from some of my supporters who had found their way to the 6 mile mark just before we turn and head around the fantastically restored Cutty Sark (a WSP project I might add). I spent most of this stretch continually reassessing how I felt and whether I had any chance of actually finishing at this pace. As each mile ticked by without me feeling any worse, I started wondering if I might be onto a good day. I hadn’t yet bothered with taking on any water or Lucozade so I grabbed some water at the next stop and had a few sips. All systems were good. This section is about one thing and one thing only. Crossing Tower Bridge. I felt my excitement building as we weaved through the streets towards the point at which you turn right and witness the enormous bridge looming up in front of you. No matter how many times I run this race, this is a goose bump moment. Last year I had the rare pleasure of sharing this moment with one of my favourite people in the world, Phil. Phil had stayed in Joburg this year so I was on my own, but as per our text chat before the race, I turned to my right where he would have been in 2013 and said “here we go mate”. Anyone seeing this probably thought “this guy has clearly lost his marbles. Talking to invisible people and we’re not even halfway.” But I didn’t care. The emotion hit me and I felt myself welling up. Man-up dude, you’re running a race here. I pressed on and crossed the bridge, soaking up every second of the amazing experience. The crowd screaming their encouragement, the bridge silhouetted majestically against the clear blue sky, a perfect spring day in the capital. It was unforgettable. It always is. As I crossed the last part of Tower Bridge I calmed myself the hell down and made the right hand turn that marks the point at which the race is about to become a countdown to the finish instead of a count up to halfway. The halfway mark. For the few miles leading up to halfway I had been telling myself to relax and get to halfway, look at the number and challenge myself to run the second half at that same pace or quicker. 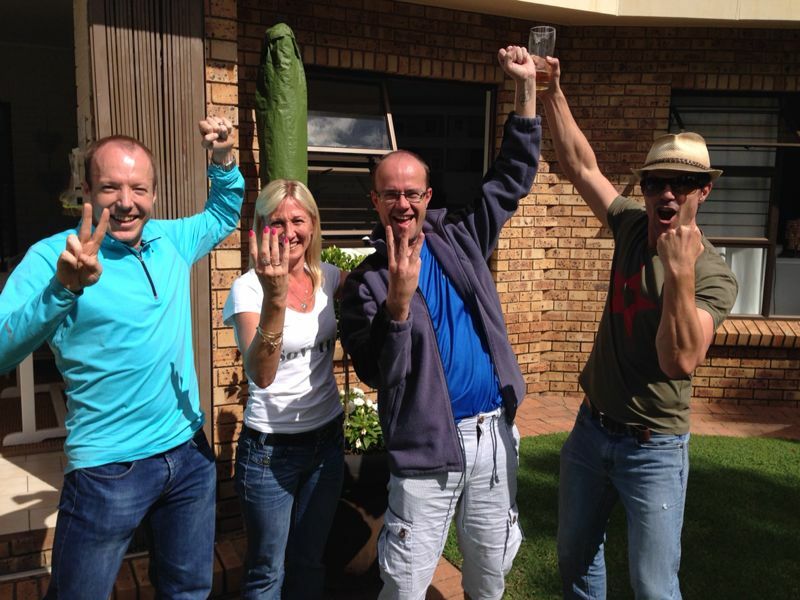 I thought of a text message I’d received that morning from another good friend, Simon, who was sharing the London marathon experience with Phil in his living room in Joburg. Simon had sent a text guessing what my halfway split might be “Mince’s Goal 21 split. How does 81:47 sound?”. I smiled at how close he had been. These guys know me well, and sometimes I think they know my running better than I do. I also smiled because I had been quicker than his guess. Small pleasures at this stage in a race. Back to business and I was still tracking Sean. We hadn’t said a word to each other but subconsciously we had paired up and were working our way through the race together. Splits just kept coming 3:51, 3:52, 3:52 and so on and so on. Something strange was happening. As we ticked off the miles, I started feeling stronger and stronger. It wasn’t a sudden change, just a slow realisation that I was now going through the 15 and 16 mile marks and on assessment of my legs, still felt like I hadn’t really started running yet and certainly hadn’t started working yet. It was a fantastic feeling and one I seldom get in marathons. Once I got to the 16 mile mark I told myself it was single figures now as we headed home. 9 point something, 8 point something miles to go. This was happening and I absolutely knew I was going to be ok. I knew I could make it to the end of the race at this pace. It was a marvellous sensation and I savoured every bit of it. Writing this now I am still savouring that feeling that washed over me as I ran through this section. My fantastic supporters had somehow managed to get to a two further points on the course and yelled encouragement at me as I trotted past. The dawning realisation over the previous few miles had begun to change things for me. I went from thinking, can I keep this up, to thinking, at what point should I put my foot down and see what I can do? Sean and I had picked up another runner, I’ll call him Ely because I think that was the club vest he was wearing. Ely, Sean and I formed a little triangle and worked together. I came really close to saying out loud “guys we are working so well together, let’s keep this going to the finish”. Something stopped me from saying it though and I think it was because it felt like I was tempting fate if I voiced how well things were going out loud. The 20 mile mark came and went in this section, and I noted that the 2:04something was a 20 mile PB for me. But we all know these intermediate splits don’t count as actual PB’s, a point Simon has made very clear in the past. I started to speed up now and broke away from Sean and Ely. I had mixed feelings about this, like I was somehow rudely ending the silent camaraderie we had shared for the previous two hours. I pressed on, feeling like I was starting to wind things up. In reality however, and I only noticed this on reviewing my splits post-race, the pace had actually stayed in the 3:50 zone and if anything had slowed a fraction. But I was raising the effort level no question and thought I was running quicker. It all began to feel very marathon-like now. A few things happened very close to one another. The first was that Sean, who had clearly been sandbagging, no wonder he had looked so comfortable all the way through this, suddenly came back past me. He was on the other side of the road as he did. Clearly the friendship was over. The lines were drawn. I upped my pace thinking, yes, I can get a tow from him and we can run even quicker. But it wasn’t happening. I was working increasingly hard to close him down, and wasn’t having any success with it. He slowly disappeared into the runners ahead of me, passing them faster than I was, until he was out of sight. It was now starting to hurt a lot. I played my final hand and poured all my effort out onto the road. No more reserve tank, let’s finish this thing. The crowd noise which I should have mentioned earlier was insane. Screaming and cheering as we gutted it out alongside the river up to Birdcage Walk and past Big Ben towards St James Park. The hurt locker, which I had been smugly avoiding even looking for the key for, was now open and I was scraping around inside for somewhere to hide. The 800m to go sign couldn’t come quick enough. Could I even get to the 600m to go sign without walking? The mind plays tricks at this stage, telling me I was spent and needed to stop. I negotiated with myself, don’t walk now, slow down if you have to (I had no intention of letting myself do this, but it’s all about empty promises to your body through the final minutes of a marathon). 600 to go. Turn the corner in front of Buckingham Palace, run under the “385 yards to go” banner. Head for home. Turning one final right hander into the finishing straight and staring at the clock at the end of it. Ticking away patiently and mercilessly. The pain is suddenly manageable in those final seconds. You know it is ending right now and the body relaxes and goes, ok we’ve got this. I watched the clock tick into the 2hr43’s as I pressed on down the home straight. Over the line, stop the watch, done. Elation. Relief. Happiness. Exhaustion. Pain. Satisfaction. All the emotions merge together in a heady mix that invariably results in me sobbing (briefly mind) like a little kid. I pull myself together and begin the post-race routine. Walk up the little ramp to get the timing chips cut off my shoes. Yep, that’s right, one on each shoe. More shameless pride in being a championship entrant. Collect the goodie bag, walk down the long line of baggage trucks. Collect my backpack. Marvel yet again at the immaculate organisation of the London marathon. Everything just works. “Mark!”. Tim has spotted me. I find him in a crumpled heap on the ground with Dan somewhere nearby. We operate in a trance, trying to find the strength to swap vests for t- shirts, drinking water, pretty much anything is a battle. This weird post marathon daze lasts only a few minutes. Energy levels get restored and balance returns. The fatigue stays, it’s there for the long haul, but now at least my mind is able to think clearly again. I dig out my phone. Dozens and dozens of messages. Thank you to each and every one of you who sent me supportive, good luck messages, and well done messages. The first time I see my finishing time is from a text conversation between my friends in Johannesburg, thanks Riaan for letting me know. They have actually created a photographic representation of my time. What a bunch of heroes. I love you guys. We walk through the finish area and meet up with our unbelievable supporters. They’ve all done a fantastic job. Probably worked as hard as we did on the roads of London today. Time to head off to a pub for some r&r. And to talk the hind legs off anyone who will listen, about the race. Timmy assures us he knows the way to the pub. He has booked a table there. “No tube necessary” he announces. “it’s only a short walk”. About 100 miles and 3 days later we stop and look at the map (again). Joking of course, we did find the place (eventually). Thanks Timmy for organising. The beer had never tasted so good. Neither had the steak sandwich (with salad not chips – Noakes and Gear nod in approval). Tired and happy we leave the pub a few hours later and head off to catch our respective trains back to Brum. 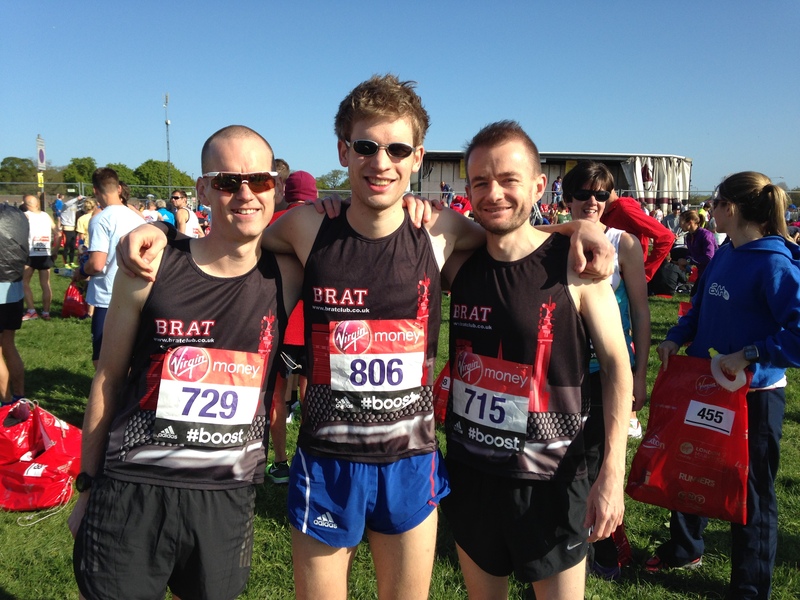 London, you provided us with an unforgettable marathon weekend, yet again. 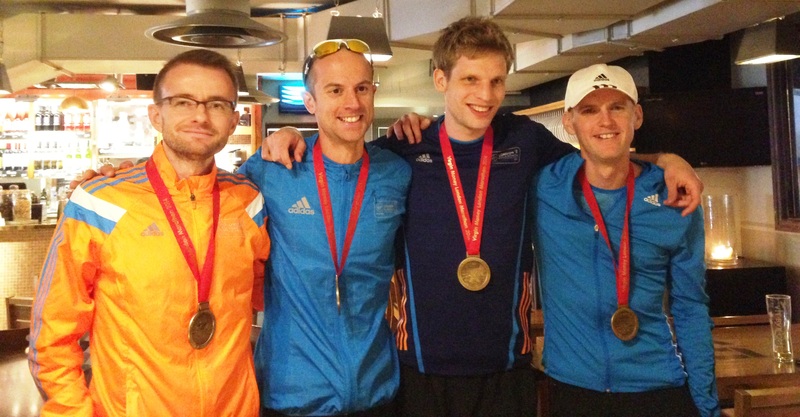 To my fellow runners, outstanding performances all round. Dan 2:34, Tim 2:34 (close behind…! ), Ed 2:57 and Eloise 3:07. All heroes. To our supporters – you were amazing and continue to impress with your dedication at finding good spots to watch us from. Thank you for buying into the craziness of the entire weekend. Mo, respect for putting it out there. Next time it will be different. This is what keeps us coming back.